Fraser Suites Sukhumvit Serviced Apartment is a five star serviced apartment building on Sukhumvit Soi 11 with large, modern apartments available. 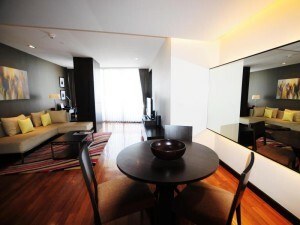 Built in 2007, rooms are modern and spacious, with designer furniture and extremely large and comfortable beds. Free Wi-Fi is available throughout the hotel with good connection speeds and reliability. Fraser Suites has a luxurious rooftop bar on the top floor of the building that has an incredible view of downtown Bangkok. A free tuk-tuk shuttle connects Fraser Suites with Nana BTS station. One of the best options on Sukhumvit Soi 11 for people with a high budget.